Ukulele teacher Mele Fong presents Pop Songs of the 50s and 60s as part of the Sing-Along with Mele Fong series on September 6 on Maui. Ukulele players invited. 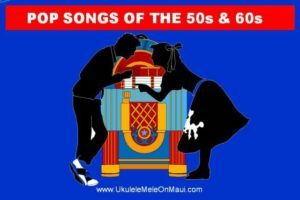 Singers and/or ‘ukulele players will sing pop songs of the 50s and 60s as part of the Sing-Along with Mele Fong series on Thursday, September 6 from 10 a.m. – noon at Kaunoa Senior Center for adults 55 and better on Maui.